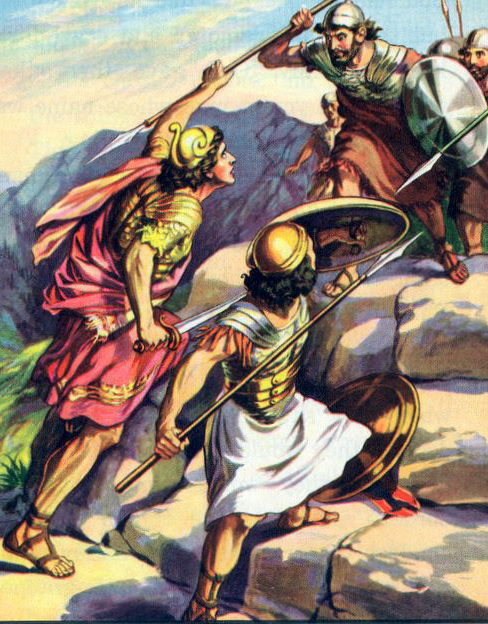 After the Philistines defeated the Israelites, they took away the sacred chest and carried it into the city of Ashdod. Then they placed the sacred chest next to their statue god Dagon in the temple. The next day, when the Philistines woke up, they discovered that the statue of Dagon was lying face down toward the sacred chest. So the Philistines put the statue of Dagon back in its place. The next morning, when they woke up, they found out that statue of Dagon is lying face down on the floor again but this time its head and two hands were broken off and lying on the doorway. Because the Philistines had taken away the sacred chest, God caused sores to break out on all the people who live in Ashdod. So the Philistines in Ashdod sent it to Gath. Immediately the sacred chest arrives at Gath, the Lord made sores broke out on everyone in Gath. So the people in Gath sent it to Ekron. The people of Gath called together a meeting of the Philistine rulers to discuss how they can send it back to the Israelites. The priests and the fortune tellers answered, “If you want to send it back, send it back along with gifts. Send five gold models of sores that are wiping out our nation and five gold models of rats that are wiping out our crops. Get two new cows that had never pull a cart. Put the sacred chest into the cart and then put the gold sores and gold rats into a bag and place it next to the sacred chest and sent it on its way. The Philistines did as what the priests and fortune tellers said. They hitched the cows to the cart and placed the bag of gold sores and gold rats next the Sacred chest. The two cows went up straight on the road to Beth Shemesh. When the Israelites at Beth Shemesh saw the sacred chest on the cart, they were very happy. Some men from the tribe of Levi laid the bag of gold sores and gold rats on the rock. They killed the two cows. Then they chopped up the woods of the carts to use it to burn the cows and the bag of gold sores and gold rats as offering to God.